I am a huge Monty Python fan. I own all the books, films, TV series and the albums. I am so much a Monty Python fan that I even collected things that the six Pythons did outside of the group. One of the things that I scoured the plains for, was a copy of Graham Chapman's A Liar's Autobiography. When I did... I was confused to say the least. I couldn't quote tell what I was supposed to take away as truth (it being a 'liar's' autobiography didn't help). Reading around his life it seems that most of it was true, but it is difficult to see where the lines are blurred. In this film it is even stranger. 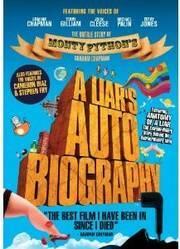 A Liar's Autobiography: The Untrue Story of Monty Python's Graham Chapman is a mix of a variety of animation styles which is narrated by Chapman from a reading he made of his book. This is a nice touch, as I'm not sure I would like someone trying to imitate him. Each of the animation styles mix well and of course with the Gilliam-style aesthetic of Python it seems to be apt that this would be done. Only Eric Idle of the Python's does not contribute which is a shame as if he had it would have technically been the first time all the Pythons had been in since the aborted reunion in 1989. I enjoyed the film, as a Python fan, but if I'm honest there was very little story that you could go along with. When I originally read the book the thing that I remembered was how dull Chapman's life was with only a few moments, such as him meeting the Queen Mother, joining Python, announcing he was homosexual and his spiral into alcoholism and recovery. Really he didn't do anything else. I suppose the same could be said about a lot of biographies that hinge on the fan's to enjoy the story because of the subject rather than the meat of the plot itself. However, if you are not a Python fan you may watch this wondering why the creators went to so much trouble. However, some of the recreations of Python sketches are wonderful and reminds me of the Sein-imations that recreated classic Seinfeld scenes in animated form from the Seinfeld boxsets. If there had been more of these it would have been better. Visually the film is stunning and as a way of storytelling it was hugely effective covering up a lot of its failings. Voicework by the Pythons and even a bizarre cameo from Cameron Diaz as Freud? No seriously! It was all great and if I'm honest if they released a new audiobook with these elements it would be a wonder to hear. The mix of all the styles is great with none of them looking awful, it's just a shame that there isn't much of a story to be told. I would be lying if I said that A Liar's Autobiography is a great film, but for a Python fan it is anything but a bit silly.